Welcome to Micro Yorkshire Terriers and the Roden Farm. Located near Knoxville, Tennessee, now only raise, Anatolian Shepherd Dogs for show, working, and pet homes. We also maintain a flock of commercial sheep. Our goal is to produce healthy, highest quality animals. 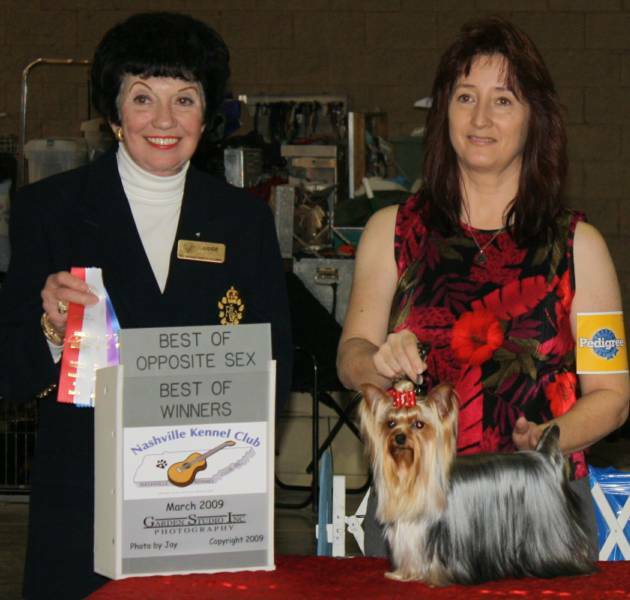 At Micro Yorkshire Terriers, we are passionate serious AKC breeders whose goals are to produce "breed standard" healthy Yorkies who are naturally affectionate therapy dogs. Our tiny, confident Baby doll or teddy bear faced friends will melt your heart! We frequently produce T-cup sized babies who will mature in the 3 to 4 lb range. While these terms are not recognized by AKC or The Yorkshire Terrier Club of America, they are phrases that the general public commonly uses to describe the more petite Yorkies with delicate facial features which is commonly seen in my family of babies. While my major emphasis focuses on that "melt your heart face", balanced structure and movement, a flat top line, silky thick straight dark coats, and an outgoing confident affectionate personality are major influencing factors. Showing is so much fun, but it's more fun when YOU WIN! I think showing dogs is the "candy' of life! 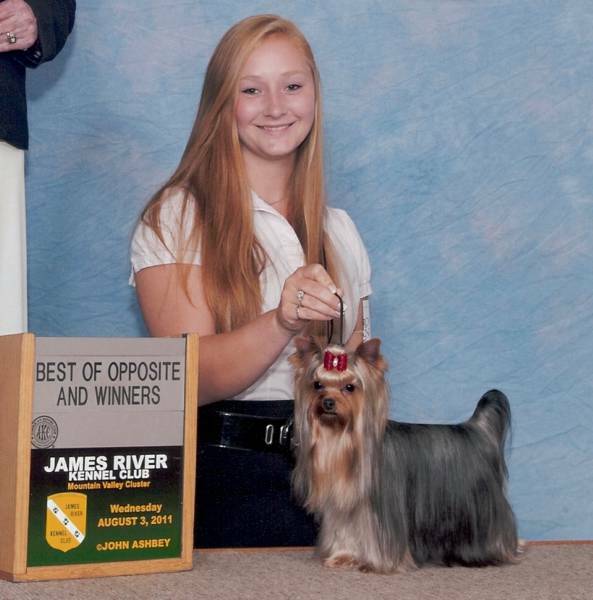 There is nothing I enjoy more than a show trip with my Yorkies and daughter Jessica! My breeding goals are to produce show quality pups for myself only. Currently, I do not sell Yorkies for show or breeding, but rather keep some babies for myself and daughter to show, then bless other families with Show quality pets. As much as I would like to, I can't keep them all! We enjoy competing in AKC Conformation, Obedience, Rally, and Agility. 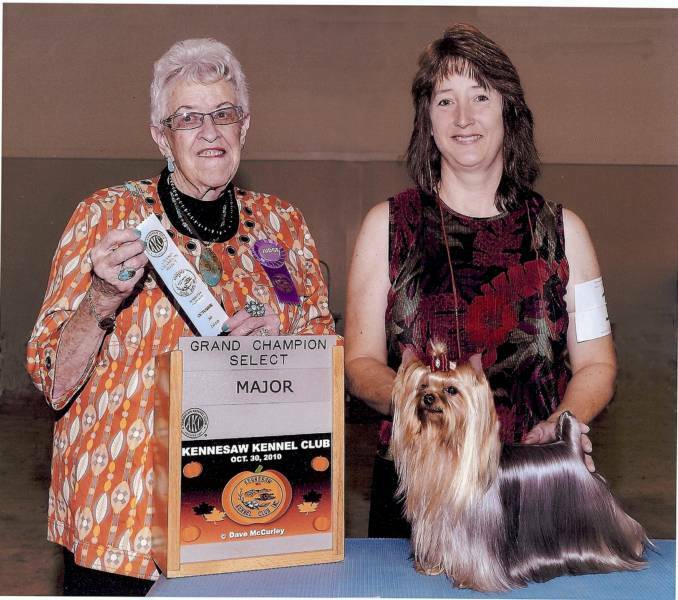 Several of our dogs have both AKC and International Championship, AKC Rally, and Obedience titles Some are also are certified therapy dogs and have their AKC CGC awards. Our puppies are all vet checked at 6 weeks old. Pups are not allowed to go to their new homes too young. Healthy mental development is as important as healthy physical development. Puppies need to be with both their mother and siblings to learn "dog social skills". When they do go home, they are well socialized up to date on vaccinations and deworming. 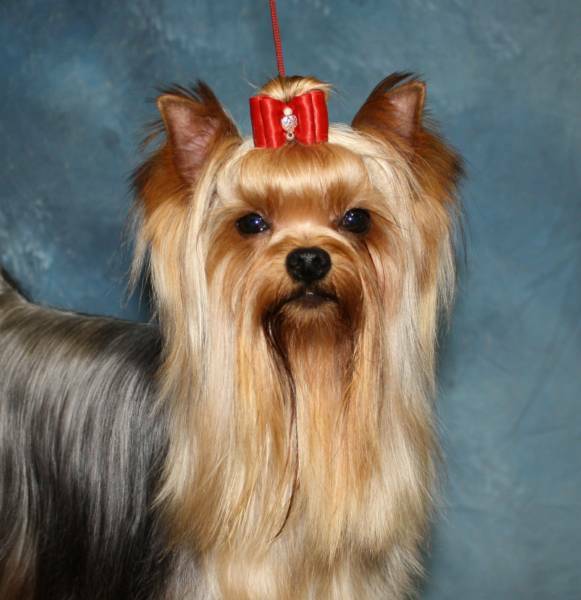 With Micro Yorkshire Terrier, your investment is protected with a health guarantee. I DO NOT sell unhealthy pups and guarantee this. My goal is to add blessings to your family, not problems. We raise our dogs in a home setting, not a kennel. All my dogs are housed in a community setting within the most actively used room in our house. They have free run with plenty of friends to play with. When relaxing time comes, you will find us on the sofa covered with our Yorkie friends. Why buy a show quality dog??? Many people have come to me stating, "I don't want to show and don't need papers, I just want a pet to love". Never has a person come to me stating, "I'm looking for a mean, shy Yorkie that is ugly and unhealthy". The reason I chose to produce show quality babies is simply. I found that the qualities of a show dog, are the same qualities that someone looking for a life long friend want. Show dogs must be happy, confident,outgoing and friendly. They must have sound structure that will give them a long life without the pain of arthritis in their golden years. They must be lovely. All Yorkie puppies are cute, but what will they look like as adults? Adding a Yorkie to your family is a LONG term commitment. You can expect to spend the next 12 to 15 years with your new friend. Do you want to spend that time thinking, "your ugly, but sweet and I love you anyway and wouldn't trade you for the world. Maybe my next Yorkie will be exactly what I was looking for"... (the reality is, I've been there, done that) Or, do you want to spend those next 12 years thinking "YOU'RE PERFECT! Sweet, smart, healthy, lovely and I'm so proud of you! (been there and DONE THAT too!!! Believe me, it's much more fun!) Our kids may be more expensive that some, but the old saying "you get what you pay for" is a reality in life. A very common question people ask me is "What kind of payment I will take". I will accept the deposit using PayPal or in the form of cash or a check if you come to the house. The check must clear the bank before the pick up date. The balance is accepted in cash or by US Postal Money Order only. I have had trouble with other types of money orders in the past so I limit money orders to the US Postal Service types. If you want to pay the balance using PayPal, it can be done without additional expense if you already have the funds in your PayPal account and send it using the "Friends and Family" option. If you don't already have the funds in your PayPal account, they will put a hold on the transfer until the funds you send them clear. If you use the "pay for goods and services" tab, PayPal will charge a 3% fee which will need to be added to your total. Concerning Sales Tax, Tennessee considers "dogs" the same as any other "item" purchased in the state and the transaction is subject to Tennessee Sales Tax which I am required to collect then remit to the state. I have researched this in depth. If I ship a dog, I am required to collect the sales tax because Tennessee considers the transaction to have taken place in Tennessee. When you come to the house to pick the puppy up, the same situation exists. The only exception to the rule is if the purchase takes place out of state. If I deliver the puppy to another state and that is where the purchase took place, I do not have to collect the sales tax. If I do not collect the sales tax when I should have, Tennessee will expect me to cover the cost myself. Delivery options are available. Hope you enjoy the web site. Drop me a note or give me a ring if you have any questions. With the addition of my two new grandchildren, my lifestyle has changed dramatically. After spending almost 20 years developing a unique bloodline that emphasizes an outgoing affectionate personality, stunning coats, and that face that will melt your heart, I have decided to no longer breed Yorkies. I hope you enjoy the pictures of my past babies on this site. Please go to our new sister site www.WhiteKnightGuardians.com to see information on our Anatolian Shepherds.